Created by Cheryl & John O. A cross between Uno, Skipbo and Mille Bornes. The object of the game is to get to Step 12 first. 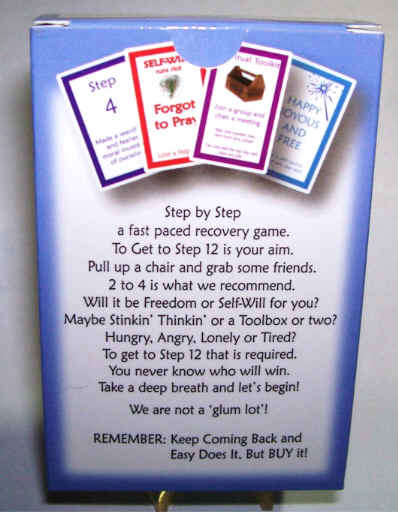 BUT there are obstacles like the Self-Will cards that can carry you back to step 3. ON THE OTHER HAND there are Spiritual Toolkit cards that allow you to steal steps from other players..
Stinkin thinkin cards make you lose your turn and everyone is Happy when they draw a Happy Joyous and Free Card. (they’re wild). Can be pretty exciting especially when someone is close and then they get sent back to 3 Or when you get to steal their step!